This topic contains 7 replies, has 3 voices, and was last updated by Billy 4 years, 1 month ago. The picture appeared in the Express and Star last week and they seem to be rather in the dark about it. As a passionate smoker until I gave up at the age of 65, something I always meant to do but didn’t , well not until I had the stroke. I remember there were two Temples to the noble weed. One was the House of Bewlay in Queens Square, corner of Dudley Street. The other was a more modest affair in Princess Street , next but one to the Cafe Royal but with a doorway into the offices of, I think, the Liverpool and London Insurance Company, which were above the shops. What really sticks in my memory is the lettering above the window. There was a Gents Hairdressers behind the Tobbaconists which I used. I can’t remember the name of the Tobacconists. Bill, check your Red Pages, was it Preedies? Can we blow up the photograph to enlarge the name plate on the side of the building. Is it it still a Tobbaconists ? I think it’s still a shop. I can’t think why the Police should prohibit queueing. I can’t remember Tobbaco ever being rationed. Have a look next time you catch the Bridgnorth bus, Bill. What did the caption under the photograph say? I remember the names Preedies and Bewlay. Another name comes to mind too, and I don’t know why. The name Rankin Wright. I don’t even remember for sure what kind of establishment this was. Anyone give me a clue as to why I’m remembering it?? Having looked on the Google Earth Map I’m 90% certain it was as I say, the Tobacconists on upper Litchfield Street. On the map it shows the property as Universal Computer Services and has a steel grille over the window. I remember it as having a window on an angle. Until we get a photograph we won’t be able to prove it. By the way, the little guy with the trilby, he seems familiar. Back in the 50’s Wolverhampton town centre was really a little village. I’m sure he was one of the town characters.You’ll remember the type Bill, when ever anything happened or a photograph was being taken there would always be one of these guys there.What about Bats Tiger, he must remember this, he probably did point duty, by Barclays Bank, at the top of Queens Square. Can we help them by indentifying the whereabouts of this Wolverhampton shop. The shop in question in 1948 was owned by Rothmans’later by other Tobacconists with barbers in the rear as both Maggie and George said Preedies is best remembered. Answer:No although they were in short supply at that time they weren’t rationed. I would say the Answer is Yes the regular queue’s were a continual obstruction to a busy pavement. I agree George the gent in front with the trilby seems to be enjoying the attention Not so his lady companion who seems to be annoyed at the cheek of the photographer. The shop in question in 1948 was owned by Rothmans’ later by other Tobacconists with barbers in the rear as both Maggie and George said Preedies is best remembered. In case you are in any doubts now of this post war location here it is. Looking across from Barclays Bank and St Peter’s Gardens at the The Cafe Royal and Prudential Building . Notice the lamp on the left above a the doorway which led to a Bohemenian type“ cellar bar” accessed down the flight of steps at the side entrance seen here in Lichfield street. 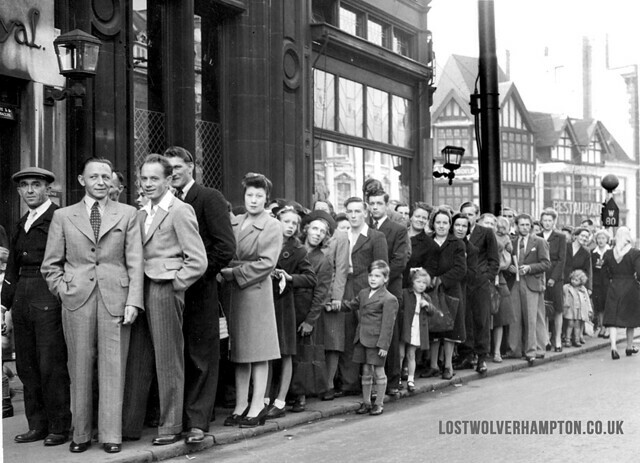 This queue outside though pictured in the late 1940’s wasn’t for the Beer cellar though it was a queue which on many occasions stretched around the corner as far as the Queen’s Cinema, for cigarettes and tobacco from Rothmans Tobacconists next door. 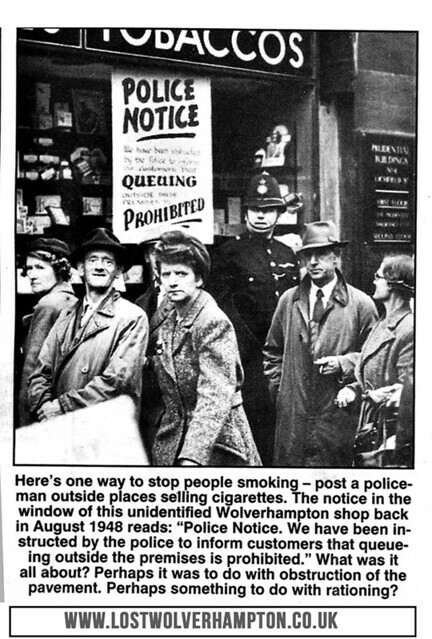 Cigarettes and tobacco were not rationed at that time but were always in short supply and you would frquentley see queue’s such as this around the town, when a tobacconists received their allocation.